Boy's Surface is the image of the well-known immersion of the real projective plane which was discovered by Werner Boy around 1903. Click on the link above for an interactive model of the surface. Level sets are also available for the model above. The first parameterization of Boy's Surface was found by Bernard Morin in 1978 and was used as a half-way model for sphere eversion. John Hughes used a polygonal model and an approximation scheme, originally suggested by Werner Boy in his dissertation, with the spherical harmonics to find several immersions as polynomials restricted to the sphere. Robert Bryant also found a smooth immersion which minimizes the Willmore energy of the surface using complex analysis. Werner Boy discovered that the real projective plane could be immersed in three dimensional space after his thesis advisor, David Hilbert, asked him to show that it wasn't possible. His work was later published in his dissertation and in a paper which appeared in Annalen der Mathematik. While this might have been the start of a full mathematical career, Boy died just a few weeks later in the first weeks of WWI, before his work became fully appreciated. Dr. Benno Artmann has done some research into the life of Werner Boy, a few details of which are available online. 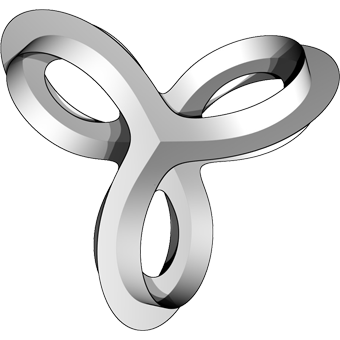 The image of the immersion above also has the same self-intersection set, consisting of a single immersed circle with one triple point. It was mentioned by François Apery in his book Models of the Real Projective Plane, in which he reports the form of the self-intersection set and gives a combinatorial model. I have generated several models of the surface with Blender, several of which are available as interactive applets generated with JavaView, including a low-polygon Catmull-Clark subdivision model of the surface, and another model based on my parameterization of the surface (described below). These models are instrumental in the paper "Immersions of the projective plane with one triple point" by Goodman and Kossowski. A set of level curves for the surface are also available. I implemented a similar approximation method to the one John Hughes used to find a parameterization for Boy's Surface. 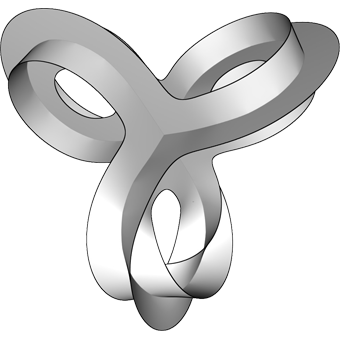 I constructed a detailed model of the surface in Blender, and then removed a Möbius strip from the surface. I then deformed the remaining surface to a disk and then to one hemisphere of a sphere. I made use of a two-to-one map from the sphere to the real projective plane and used Mathematica to approximate the original coordinate functions with spherical harmonics, and then transformed them to polynomials defined on the unit sphere. The final parameterization is given as three degree four polynomials restricted to the unit sphere, in which only even terms appear. I am currently working to prove that this is an immersion.